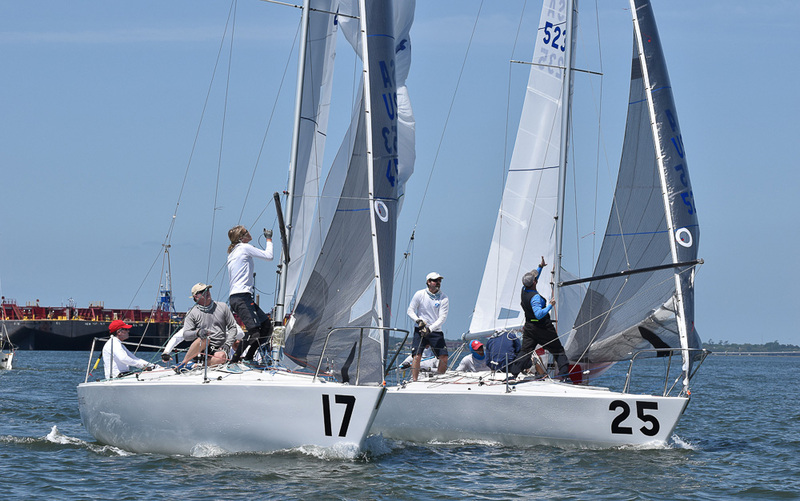 The 2018 J/24 North American Championship were hosted by Charleston Yacht Club. For those that have not sailed there before there is a LOT of current, it is shifty and there are obstacles such as land, towers, and barges that all come into plan. It is a place where you need to sail heads up and have a sense of humor. You are going to make mistakes – lots of them, there is no avoiding them! But with all that, boat speed matters. We had good speed and with that, we often won our side. Even if we were wrong, we could get out alive to claw back. Another advantage of speed in that crazy stuff is that we could break free from our pack and were able to then take advantage of a shift or other opportunity. Conditions were flat water and all genny (no blade), but within that, we had a wide range of velocity form almost drifter through top end of the genny. Since it was flat water, we set the genoa leads to “touch –touch”, meaning when we over-trimmed the genoa, it touched the spreader and the chain plate at the same time. Then we sheeted hard on both main and genoa because we were now looking for power, and when we can get away with it in flat water, the J24 likes to sail high. We trimmed the genoa tight, maybe 3” off the spreader, but would ease both main and genoa a little for some waves or to help through any transition. With any puffs, we would trim a little tighter to keep the leaches tight, in lulls we would ease to keep the leaches from getting too tight. 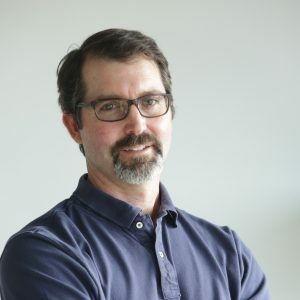 “Full hike” would let the team know that I need them all to hike as hard as they could and that would also be a reminder to myself that my mode has changed from underpowered to overpowered. If I am looking to depower my first move is the backstay. With the backstay on, I would trim the main a little more because while the backstay flattens the sail, it also opens the leach too much. Conversely I had to remember to ease the mainsheet when easing the backstay so the leach would not be too hooked. If that was not enough to depower, pinching a little in that flat water seemed ok. The cunningham and genoa halyard went on too to help depower. My last resort was easing the sheets. We rarely had to do so this weekend, and I only do this if I have exhausted all the other depower options. We talked about this at our dock talk after racing Saturday. See video below. 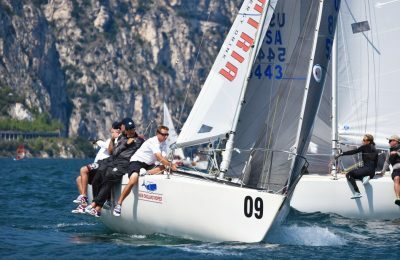 Learn more about North’s fast J/24 sails.